NEGROMANCER 2.0: Image Comics Announces New Storyline for "Saga," Entitled "The War for Phang"
Image Comics Announces New Storyline for "Saga," Entitled "The War for Phang"
Award-winning creative team of Brian K. Vaughan (PAPER GIRLS, WE STAND ON GUARD) and Fiona Staples (Archie, North 40) will launch the eagerly anticipated seventh chapter in the multiple Eisner Award-winning series SAGA this August. Previously in SAGA, Hazel tackled kindergarten—her biggest adventure yet—while her family went up against some difficult lessons of their own. 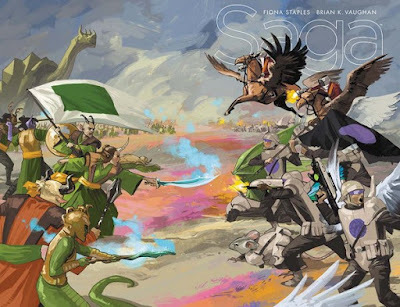 In SAGA #37, finally reunited with her ever-expanding family, Hazel travels to a war-torn comet that Wreath and Landfall have been battling over for ages. To celebrate the arrival of the most epic arc yet, Fiona Staples graces this issue with a gorgeous wraparound cover! “There’s a flood of new #1 issues out right now, but with this self-contained SAGA ‘event,' Fiona and I hope to tell the kind of deeply emotional epic that you can only get from an ongoing series at the ripe old age of 37,” said Vaughan. “The War for Phang has huge stakes and will create permanent, real changes for Hazel and her family. Get ready." SAGA #37 (Diamond code: JUN160601) hits comic book stores Wednesdsay, August 31st, 2016. Final order cutoff deadline for retailers is Monday, August 8th, 2016.